Most severe headache and migraine sufferers will agree they would do just about anything to relieve the constant pain and aggravation. Some medications can have serious side effects and can actually lead patients to experience a “rebound” headache. Unlike synthetic drugs, acupuncture has virtually no side effects, and the procedures for treating headaches/migraines are much less invasive with acupuncture than with surgery. Nearly everyone will suffer a headache at some point in time. They are one of the most common physical complaints that prompt people to treat themselves or seek professional assistance. Some estimates say that up to 50 million Americans suffer from severe, long-lasting, recurring headaches. Traditional Chinese Medicine (TCM) has a very consistent philosophy-based framework for headache etiology, physiology, diagnosis, and treatment strategy. Acupuncture has been an effective treatment for headaches/migraines for over 3500 years. Headaches result from either a vaso-constriction or vaso-dialation of the carotid artery – the main artery that passes through your skull to the brain. Acupuncture physicians are trained to note slight indifferences in both physical and mental symptoms in order to treat a headache or migraine effectively. When placed in specific points away from the head, acupuncture triggers a healing response by relaxing the muscles and increasing circulation. This not only treats active headaches/migraines but also helps prevent any further areas from occurring. 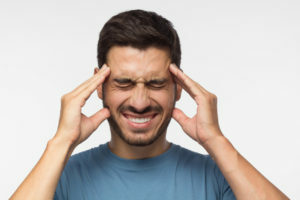 In a study published in the March 2004 edition of the British Medical Journal, researchers did a double blind study of 401 adults aged 18-65 years old with chronic headaches. Researchers found that the group who received acupuncture experienced a significant decrease in ossuaries and duration. Not only that but this same group was surveyed a year later and found they had experienced 22 fewer days with headaches, 15% less medications, 25% fewer doctors visits and 15% fewer days off work. With results like this, it’s no surprise that more and more people are choosing acupuncture to treat their headaches.